Technology is changing healthcare administration. As a result, the United States Bureau of Labor Statistics (BLS) expects many of the services that once were only found at hospitals to be available at the offices of health practitioners.i That may translate into an opportunity to enhance your career by earning a bachelors in healthcare administration online degree. Click on any of the sponsored listings on this page to learn more about individual online bachelors degree in healthcare management programs and request more information. The term “healthcare” encompasses a wide variety of issues. These topics include insurance, prescription drugs, and health information technology. Typically, an online bachelors degree in healthcare management degree takes four years to complete. During that time, you may gain a business background as though you were earning a business degree. However, these courses will focus on the challenges that face medical and health service managers in the healthcare industry. When it comes to bachelors in healthcare administration online degrees, there are a number of different names and degree options. As you can see by checking out the sponsored listings on this page, there are many different degree names when it comes to earning your online bachelors degree in healthcare management. While they may be similar, it’s important to research individual schools and programs to find which may be the perfect match for you. 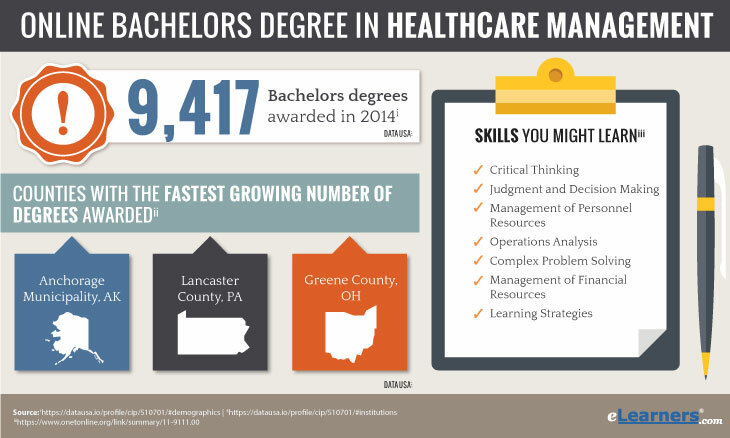 When deciding to earn your online bachelors degree in healthcare management, you have many different degree options. This includes choosing between a bachelor of science (BS), a bachelor of arts (BA), and a bachelors of business administration (BBA). While there are many similarities, there may also be subtle differences. Bachelor of arts, or BA, degrees typically provide a more well rounded education. That means course requirements may include more emphasis on literature, mathematics, history, or social sciences. This may differ from a bachelor of science, or BS, which is normally more technically focused. Depending on the individual school or program, that may include less opportunity to take courses in other areas. In comparison, a bachelor of business administration, or BBA, degree is more heavily focused on providing students with a business background and advanced courses in a specific specialty. This may include developing the functional knowledge of companies and organizations through practical experiences such as internships, industrial visits, and interactions with industry experts. Typically, courses you may take while earning your online bachelors degree in healthcare management focus on the business side of the healthcare industry. That means providing students with business and management courses similar to those in other business degrees. But most of these courses will pay special attention to how those courses apply to the unique challenges that face healthcare professionals. Healthcare Strategic Management and Policy: This course examines the nature of the healthcare system in the United States and covers topics such as quality of care, funding, and healthcare reform. Healthcare Research and Evaluation Methodologies: During this course, students will be taught how to apply assessment instruments, data collection, research designs, and statistical analysis in regards to assessment and planning. Healthcare Quality Management: Students are taught the management of operations and how advanced methods can improve healthcare processes, delivery, and outcomes. This course may focus on patient wait times, productivity, and generally improving healthcare management processes. Organizational Behavior: This course focuses on leadership, group dynamics, and organizational structure and all of the different factors that may influence behavior in organizations. Healthcare Management: Students may examine healthcare administration from an operational perspective, which may include such topics as quality improvement, risk management, and financial planning. Health Law: This course is a basic study of the legal system in the United States and the issues specific to healthcare services, such as negligence, contracts, informed consent, and many others, as well as current and ethical questions. Epidemiology: During this course, students may compute and interpret basic health status indicators, as well as different disease prevention strategies, as well as how to apply epidemiology to the analysis of the health status of communities. Human Anatomy and Physiology: Students are taught how human biology links with human health through topics such as the structure and functions of the human body, chemistry of life processes, and nutrition and metabolism. Human Resources Management: This course examines human resources strategy, equal employment law, and diversity in the workplace as well as employee training and development and employee motivation through compensation and benefits. Healthcare Financing: During this course, students are taught an overview of basic financial principles and concepts used in the healthcare industry. These topics may include methodologies and tools to analyze financial data. This may develop a greater understanding of the challenges healthcare administrators face. As technology continues to improve, the BLS expects job growth in nursing care facilities, in the offices of health practitioners, and in medical group practices. Therefore, earning your online bachelors degree in healthcare management may enhance your career. Click on any of the sponsored listings on this page to learn more about individual programs. From there you can check out program descriptions, admission requirements, and contact the school directly to request more information. Research as many schools as it takes to find the perfect bachelors in healthcare administration program for you!